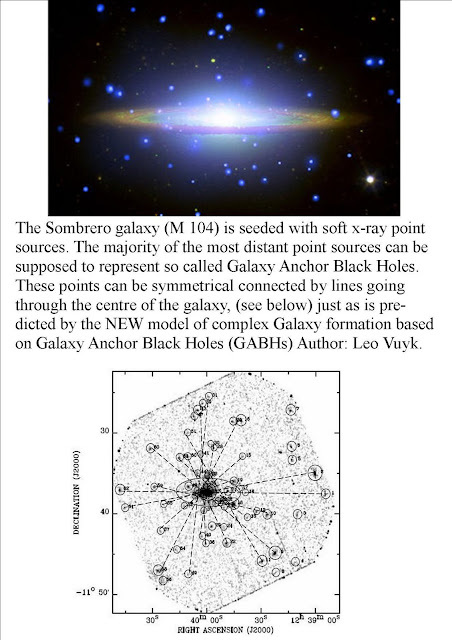 Latest descovery of the influence of Galaxy Anchor Black Hole located on both sides of a Spiral Galaxy: dated 9-11-2010. See also below: M82 Galaxy with huge gas clouds at both sides of the Galaxy. 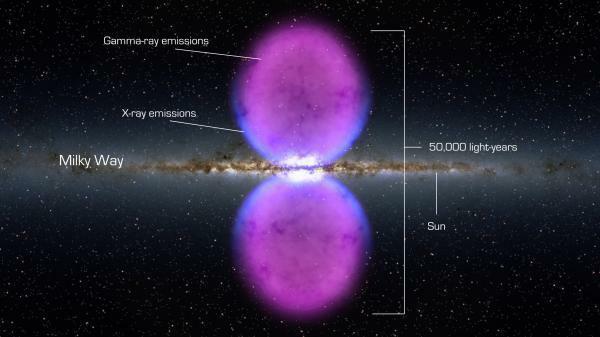 NASA's Fermi Telescope Finds Giant Structure in Our Galaxy. Giant black holes speeding up Galaxy formation, seem to be located on both sides of Spiral Galaxies, not in the Galaxy center! Only small black holes are expected to be there. 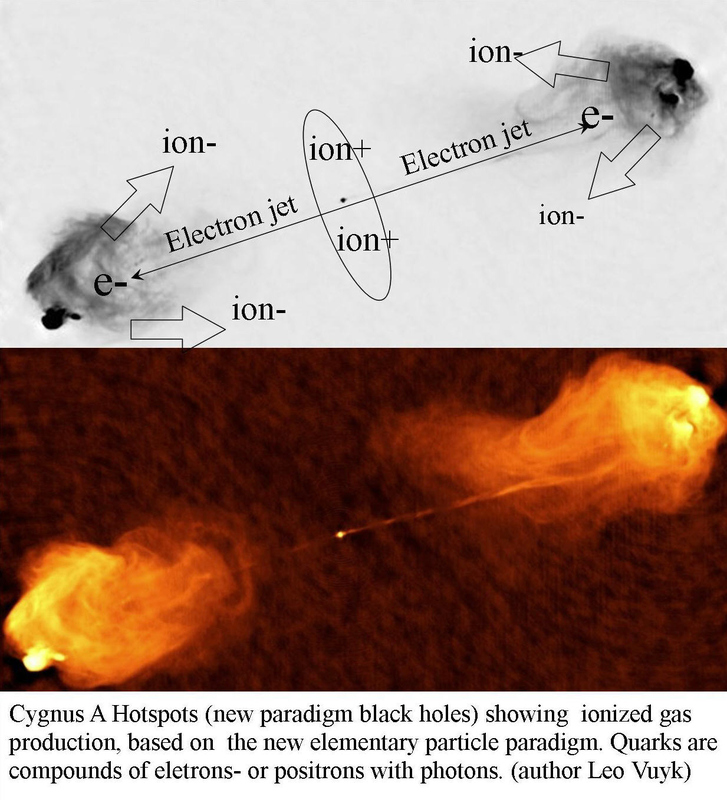 TYPICAL EXAMPLE OF CHARGED PLASMA GAS AND DUST produced by both Fermion producing and repelling black holes, moving away from the black holes, driven by electric fields, to the Galaxy CYGNUS -A. 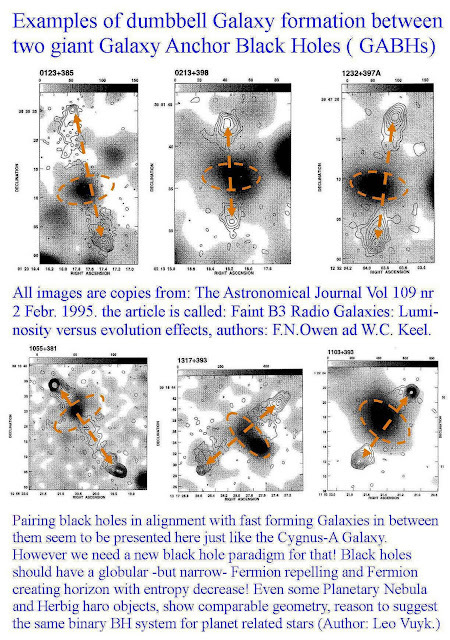 The two GABHs are clearly visble on both sides of the Galaxy as distinct globules. DARK MATTER SPHEROID AROUND A GALAXY OR GALAXY CLUSTER DETERMINES THE SIZE OF THE OBJECT. The shape of the spheroid seems to be a so called "prolate speroid". 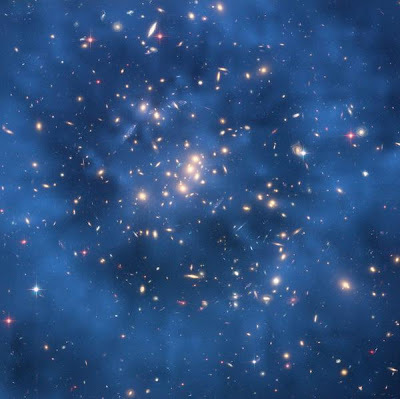 Dark matter is either weirder than we thought or does not exist at all, a new study suggests. A galaxy is supposed to sit at the heart of a giant cloud of dark matter and interact with it through gravity alone. 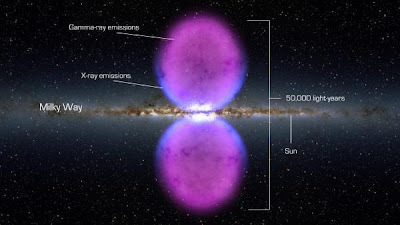 The dark matter originally provided enough attraction for the galaxy to form and now keeps it rotating. But observations are not bearing out this simple picture. Since dark matter does not radiate light, astronomers infer its distribution by looking at how a galaxy's gas and stars are moving. Previous studies have suggested that dark matter must be uniformly distributed within a galaxy's central region – a confounding result since the dark matter's gravity should make it progressively denser towards a galaxy's centre. Now, the tale has taken a deeper turn into the unknown, thanks to an analysis of the normal matter at the centres of 28 galaxies of all shapes and sizes. The study shows that there is always five times more dark matter than normal matter where the dark matter density has dropped to one-quarter of its central value. 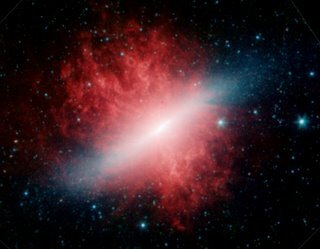 The finding goes against expectations because the ratio of dark to normal matter should depend on the galaxy's history – for example, whether it has merged with another galaxy or remained isolated during its entire existence. Mergers should skew the ratio of dark to normal matter on an individual basis. It is said that only very few matter is found to be attrackted to the center of the Galaxy, WHY? the central Black hole seems to in a dormant state!!! The pairing of primordial Galaxy Anchor Black holes hes a merger effect and seems to be the origin of Galaxy complexity. 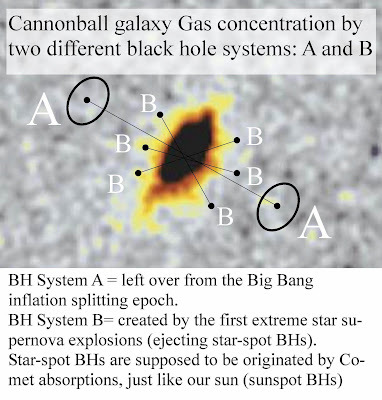 BLACK HOLE PAIRS OR BETTER BINARY BLACK HOLES, are the base for fast galaxy formation after the big bang. Primordial black holes are supposed to be "left over" from the evaporation process of the bouncing Big Bang as giant black holes. The next plate present ﻿three examples of early galaxies with two or even three "HOTSPOTS"
Acoording to FFF theory all these galaxies should present at least THREE hotspots, one large in the middle and two smaller ones which are aligned with the core of the galaxy. 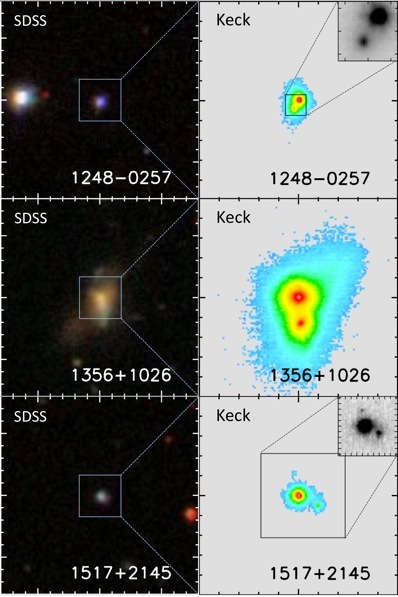 ( see the last image: SDSS: 1517-2145). The Sombrero Galaxy, an example of primordial Galaxy Anchor Black Hole merging complexity. Quate:"DID colossal spinning loops of energy whip up the magnetic fields that thread through galaxies and may even stretch across intergalactic space? That's the idea being put forward to explain the universe's mysterious magnetic fields. "Wherever we look, we find a magnetic field," says Mark Wyman, a cosmologist at the Perimeter Institute for Theoretical Physics in Waterloo, Ontario, Canada. "But nobody can explain where they came from." Mainstream Physics is not able to explain the complexity of the Universe. 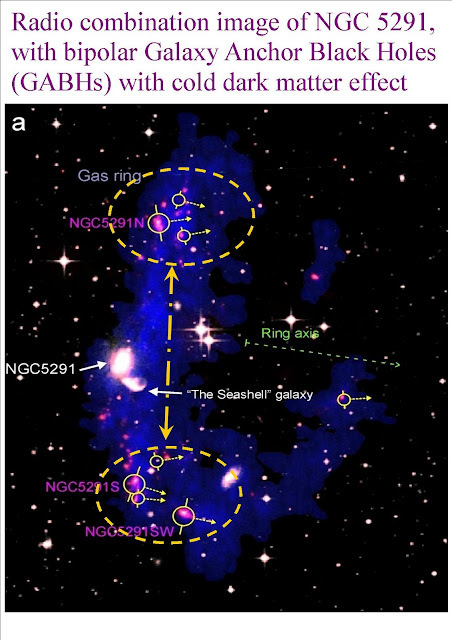 It is a world of guessing about real Nature, like the origin of Galaxy form and formation or Dark matter rings around the Cl0024+17 Galaxy cluster. 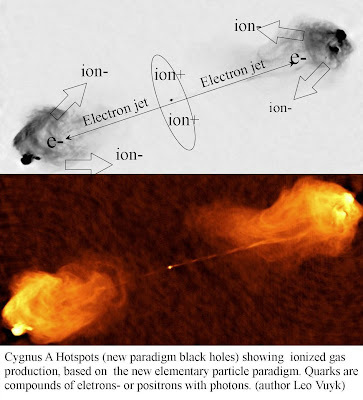 As a consequence new experimental based tools ( see below, like magnetic monopole photons ( N+S), real (propeller) shaped Fermions), new ideas about the energetic oscillating (chiral) vacuum and NEW Black Holes are postulated. As a result, “Galaxy Anchor Black Holes”, are supposed to be the seeds ( splinters) left over from a “new” Black Hole-splitting and evaporation Big Bang. 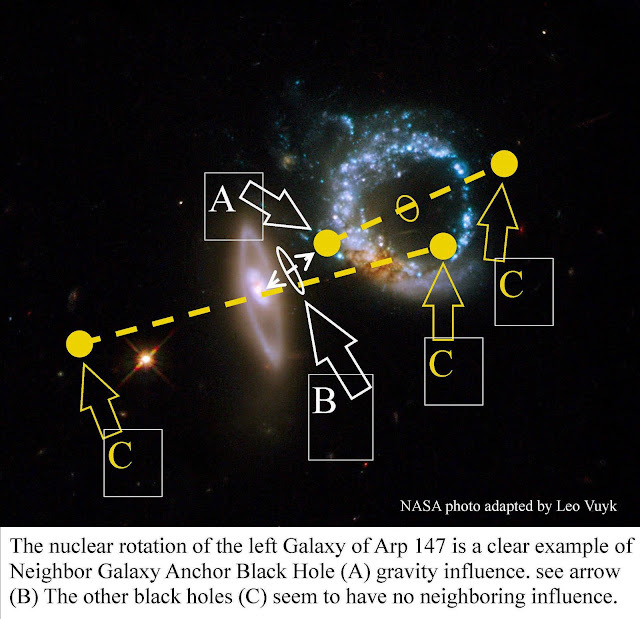 “Stellar and Galaxy Anchor Black Holes”: able to Migrate inside and outside Galaxies, able to find other migrating Black Holes and “merge” ( see: 3C75) creating "dual black holes" forming the opposite Lobes like the Cygnus- A Lobes with so called hotspots as the representation of the black holes . 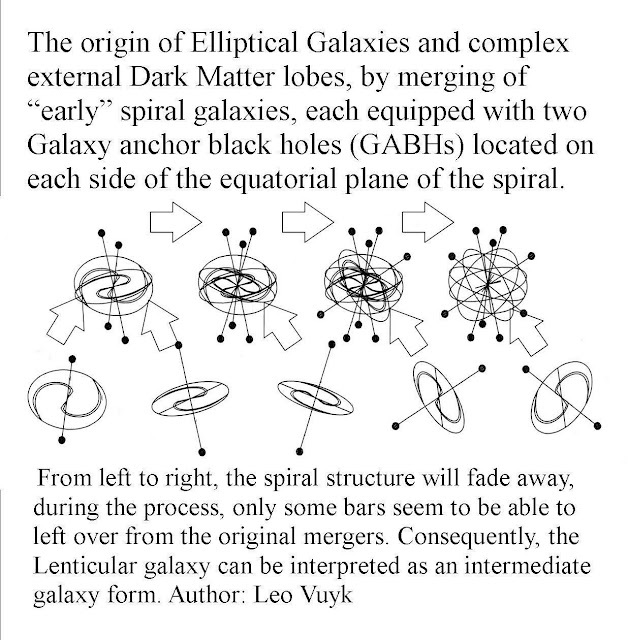 GALAXY COMPLEXITY: is supposed to be possible from simple spiral Galaxies, equipped with only two "Galaxy Anchor Black holes" (GABHs) , up to Elliptical Galaxies with GABHs all around. 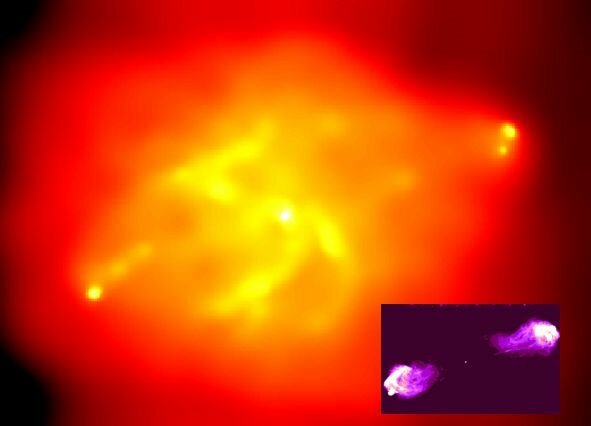 The Dark matter ring recently spotted in a Galaxy Cluster, has an obvious resemblance with a large scale Lenticular Galaxy form. Hubble sees Dark matter ring in a galaxy cluster CL0024+17. 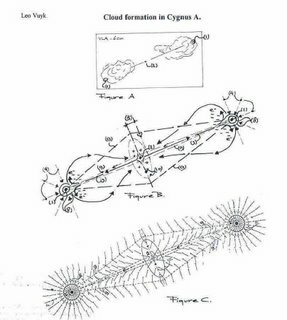 Conclusion: All ring shaped structures in space at all scales, from Cygnus-A, Eta Carina up to CL0024+17, seem to be formed by dual black hole influences. with gas concentration in the middle. Cygnus A , is supposed to be THE example of a perfect Cosmic electric generator in between two or even more dual black holes in the form of a dumbbell. How is it possible that these NEW Paradigm black holes are repelling fermions? All NEW Paradigm Black holes are supposed to have a local Fermion repelling horizon. Bosons are absorbed, but Fermions are repelled!! due to the special propeller form of Fermion particles, and the local Higgs structure of the vacuum at the black hole horizon , see below under "Higgs repulsion zone". Dual Higgs-Graviton quantum gravity of this model can be described as a kind of dual "Macro Casimir effect" or Dual- or Double Le Sage gravity. The total Higgs pressure from outside acting on a mass like the earth, is larger than the Higgs pressure coming from the inside of that mass, because inside the earth, many Higgs particles are assumed to change by collision with chiral Fermions into Gravitons. Gravitons are supposed to have less pressure capacity than each Higgs particle. Gravitons are supposed to be not able to change by collision into other particles. 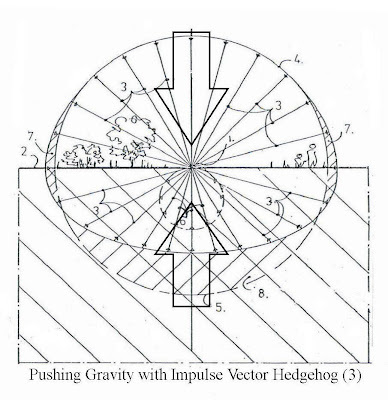 Anti-symmetrical globular shaped HIGGS-GRAVITON impulse vector HEDGEHOG profiles, the origin of Quantum gravity. If we imagine that the vacuum all around us is filled up with a Planck-scaled crystalline network of oscillating Higgs-particles, then the vacuum is MORE DENSE than a Neutron star's Fermion interior. This is hardly to imagine, but a real possibility to explain all relativity effects . Quantum Gravity at the surface of our Earth, will show an anti-symmetrical Globular Higgs pushing "impulse profile" ( like the Casimir force) in combination with a less strong one-sided Graviton impulse profile (9) pushing Fermions up instead of down!! Click on the picture below for enlargement or download. for normal gravity on earth. The four-dimensional CDT model of quantum gravity is extremely simple. It is the path integral over the class of causal geometries with a global time foliation. In order to perform the summation explicitly, we introduce a grid of piecewise linear geometries, much in the same way as when defining the path integral in quantum mechanics. Next, we rotate each of these geometries to Euclidean signature and use as bare action the Einstein-Hilbert action8 in Regge form. when one approaches sub-Planckian scales the theory effectively becomes a topological quantum field theory where the metric plays no role. Also in our very explicit implementation of a quantum gravity model it is unclear how such a scenario would look. According to this new particle system, Mass in motion needs a particle MEMORY system to memorize "Lorentz polarization" or "Fermion Consciousness". If we imagine that in such a dense vacuum lattice, mass has to be able to move and accelerate, then we need something very special to keep a tennis ball in motion after it is hit by your racket. 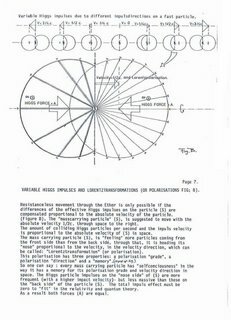 We need to introduce a Higgs oscillating vacuum Lattice, which we could call "COMPLEXIFIED Lorentz space" able to push or pull spinning Fermion propellers and transform complete atoms to create "REAL Lorentz dilation in time" but NO "Lorentz CONTRACTION". Why? 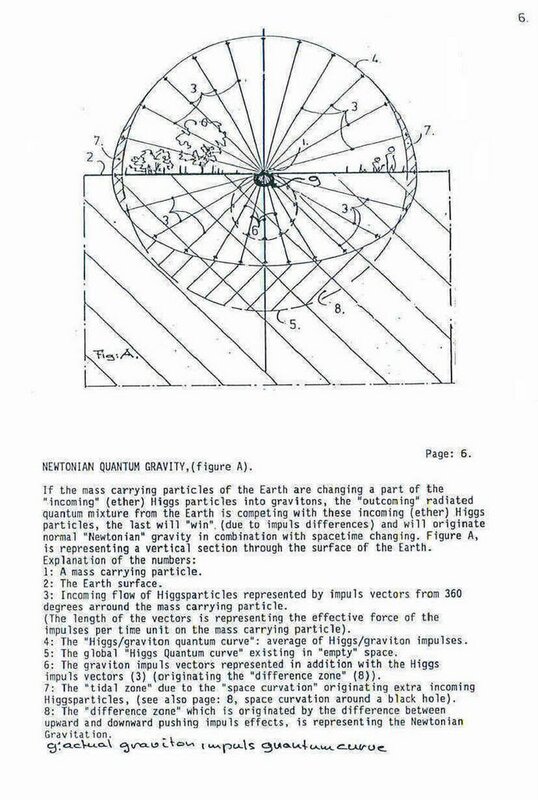 Because if we assume that gravity is dragging the lightspeed with the Earth, then all the Michelson-Morley apparatusses should have shown a diurnal effect!! originated solely by the contraction of the apparatus itself!! Thus ONLY "Lorentz TIME DELATION is real" and the logical result of a quantum mechanical Higgs-Fermion collison process. In other words, I would call these particles: "Lorentz polarized" Fermion propeller particles with a double spin state, able to absorb more "Casimir" vacuum energy from behind than from the front side. ( see Figure B) below. I suggest the symmetrical Big Bang ENTANGLEMENT MEMORY is still acting between two or more IDENTICAL but CPT ( Charge Parity and Time) symmetric Universes to solve the so called "Schroedingers CAT problem" and also the "Lorentz polarization" memory !! It was Socrates ( 479-399 BC. 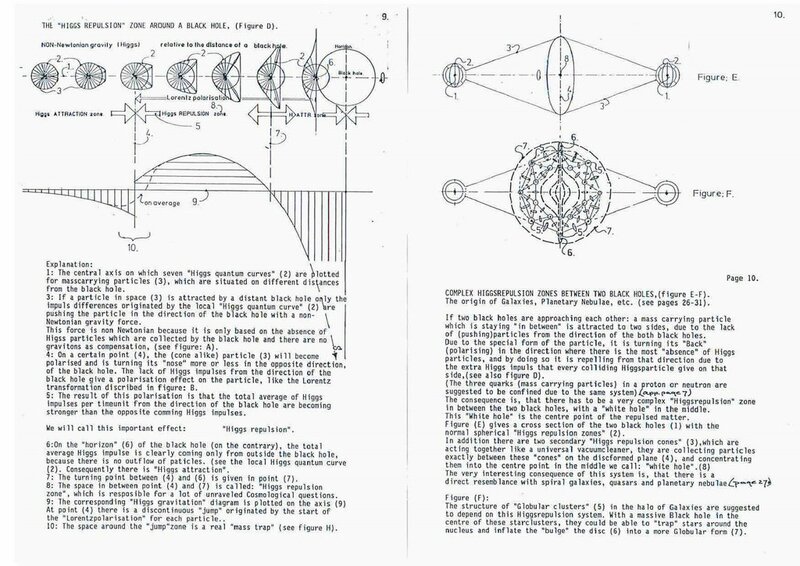 ), who supposed that all objects in motion should have a so called unmoving mover, as the origin of the motion. This model predict an oscillating (unmoving) mover. The gravitational consequences of the oscillating vacuum for a NEW BLACK HOLE is: that only pure Higgs ( Casimir) Gravity can exist. 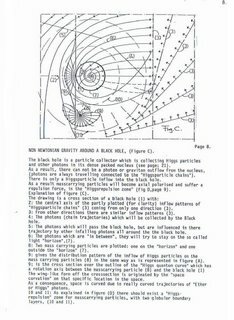 The reason is, that no Gravitons can leave a black hole. 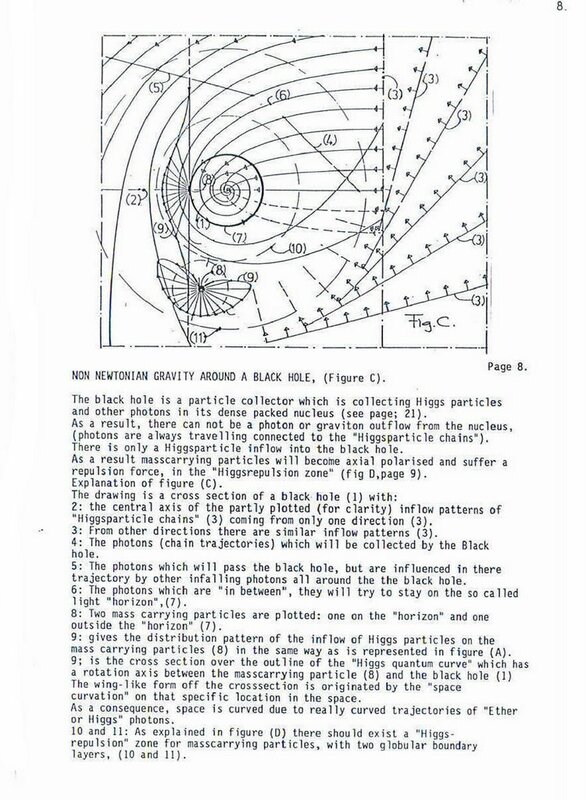 The motion consequences of the oscillating vacuum for a NEW BLACK HOLE is, that Black holes are STUCK unless an outside influence like a "gas tail" is able to influence the globular symmetry of the black hole horizon. This New Black hole gravity in combination with propeller shaped Fermions creates a second consequence: the existence of a FERMION REPULSIVE HORIZON around the NEW BLACK HOLE , which is visible as polarized negative charged gas clouds around so called "Lobes" of lots of Quasars, HH- objects, AGNs etc. like Cygnus A.
into Binary systems, forming the base for Quasars, HH objects, Spiral and Lenticular Galaxies and all charged particle Jet formations. "Suppose that in the world everywhere there are a lot of (space filling vacuum-) particles, flying through us at very high speed. They come equally from all directions, -just shooting by- and they also partly hit us in a bombardment. We and the sun, are practically transparent for them. Practically, but not completely,and some of them hit. 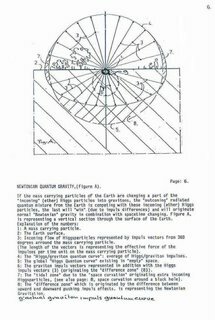 Look at what would happen; If the earth is moving it is running into the particles coming towards it and away from the ones that are chasing it from behind. 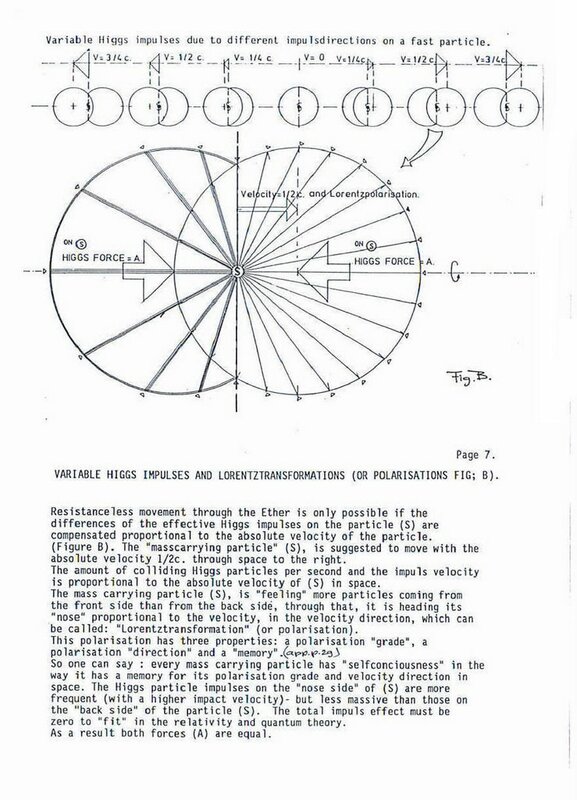 So more particleswill hit from the front than from the back, and there will be a(vacuum) force opposing any motion. 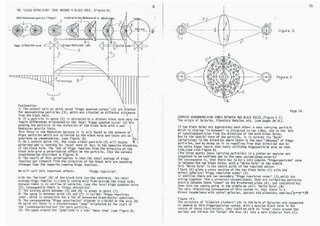 This force would slow the Earth up in its orbit" (which is proved to be not the case); so that is the end of that theory......! .......Well you say, it was a good one, and I got rid of the mathematics for a while, maybe I could invent a better one". That is the gist of this weblog. In "Crazy" but SERIOUS contrast with Richard Feynman's story, this new model assumes that Nature may compensate such an opposing vacuum resistance by a NEW vacuum MECHANISM..
2: if the mass carrying particles (of the Earth) have the ability, by real Lorentz transformations, to absorb just enough energy of this oscillating Higgs-vacuum frame in the right direction to compensate for the opposing vacuum resistance and to keep this Lorentz polarization in its memory as a guiding mechanism. This polarizing guiding mechanism is coined a "Big Bang Entanglement" memory, active from the beginning of the universes between TWO OR MORE CPT ( Charge Parity and Time) symmetric ( anti-) COPY UNIVERSES!! and also acting as an instantaneous medium to keep the object- subject "eigenstate" of each particle harmonized..
As a result. 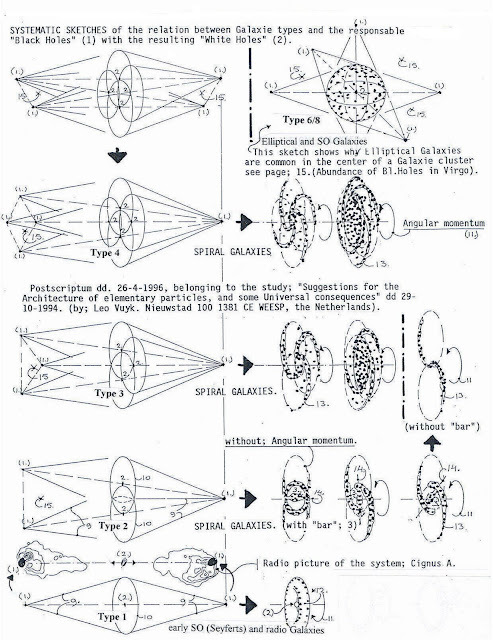 this weblog describes my personal alternative reductionist’s view on some aspects of mainstream physics and astronomy.In general this alternative contribution is the product of intuitive and logic thinking about a three dimensional image of reality down to the Planckian scale of the cosmos.I choose a so called "Lattice model" base for the vacuum in contrast with the so called “continuum of space and spacetime models”. Both ideas about the structure of space are well known in mainstream physics.This Lattice model concentrates on the way SPACE is fully filled-up with a topological 3-D lattice which represents the oscillation trajectories of Higgs particles.These Higgs particles are assumed to have a rigid RING-form and able to transform the ring by collision into real rigid Fermions or Bosons.It is assumed that at each lattice there are two Higgs particles active in a continuous oscillation process able to transfer bosonic information from the source of the boson down to the measurement location in some unresolved digital (or trigital tetrahedron) way.Secondly it is assumed that Higgs particles transform their shape into bosons, (photons, gravitons, gluons) by collision processes with real spinning Fermions.As a result, the energy (radiation) and the Spin of the electron is produced only by mechanical Collisions. Thus it is assumed that the form of Chiral Fermions should have a “propeller form “ with left- or right handed PITCH to realize a left- or right handed Spin.HIGGS-GRAVITON QUANTUM GRAVITY.The Fermions of the Earth are assumed to produce gluons, photons and gravitons by the Higgs collision process..As a result, there are more Higgs particles with a Higgs identity going into the Earth than there are Higgs particles with a Higgs identity coming out.If we also assume that the average Higgs collision impact on Fermions is larger than a graviton impact on Fermions, then a new kind of Quantum Gravity is presented: the “Higgs-Graviton Quantum Gravity". It is postulated that the length of these lattices are in general (in normal vacuum, far away from Black holes) the same in length, they are gathering together at connection points.The structure of the lattice is of a tetrahedron kind of shape, which is equipped with a so called “chiral rotation” (left or right handed) all through the vacuum inside one and the same universe.